Circadian rhythms are the body's sleep-wake cycle. While we may not perceive it, there is a lot of complex stuff going on while we drift off to sleep. Our ability to snooze is derived from a neurohormonal balance regulated by a substance called melatonin. Melatonin makes us biochemically programed to sleep in the dark and stay awake when there is light. Melatonin production increases in the dark and plummets once the brain perceives light. ...and dark = total dark. We evolved with bright days and dark nights. Circalux was founded by a group of medical students who recognized a timeless problem - the inherent need for people to get good sleep coupled with the fact that people need light to accomplish tasks overnight. 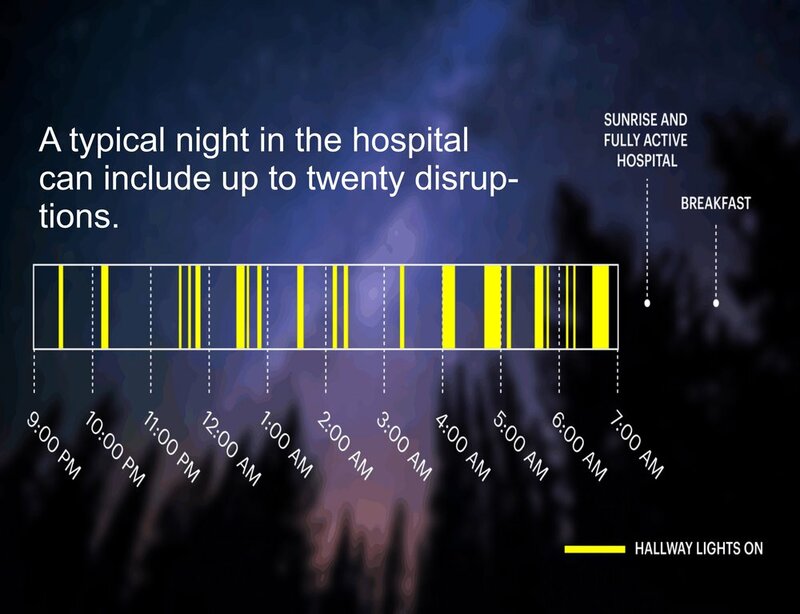 At first, we looked at hospital patients, who are bombarded with light stimuli overnight by their attentive caregivers. Healthcare providers know that disrupted sleep is bad for their patients, but they still need light to do their jobs. Studies have shown that ICU patients can be disrupted up to eight times per hour overnight and that 88% of providers think that poor sleep can hurt clinical outcomes. Then, we realized that other groups are vulnerable to frequent night-time light disruptions - including parents with young children, kids, the elderly, and jetsetting travelers to name a few. Ten percent of children aged 6 months to 3 years old have a sleep disorder, which can impact the wiring of their developing brains and impact daily activity levels. Elderly populations, who naturally make less melatonin than younger folks, also struggle with sleep difficulties, which can worsen impairments from Parkinson's or Alzheimer's disease. Perhaps light doesn't seem like the biggest culprit when it comes to poor sleep, but it plays a bigger role than you think! With these groups in mind, the Circalight was born. 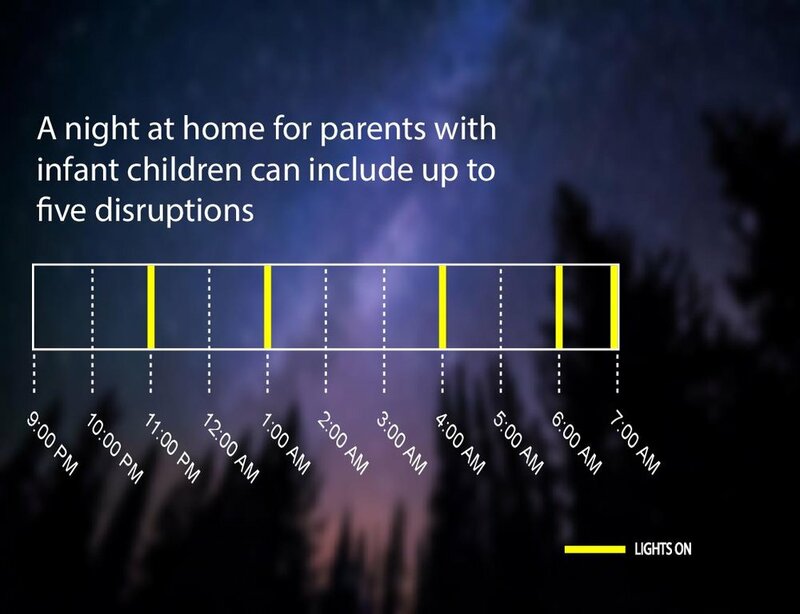 Circalux offers a circadian-friendly night light that can be placed anywhere in a room and automatically turns on as you approach - thereby giving you sleep-healthy light when and where you need it. During our design, we were excited about reliable, consistent performance that resulted from quality development. We also wanted to create a light that is equally at ease in the home as it is by the campfire. Remember those five lighting factors that were discussed above? Let us show you how we have tackled each of those in our design. Shorter wavelengths of light, which appear blue to your eye, are the most disruptive at decreasing this melatonin production. Current white lighting in hospitals and homes emit a wavelength of light ranging from 400 to 720 nanometers, meaning melatonin plummets any time that an overhead light is turned on. On one hand, it is great to have light that keeps you up during the day, but you don't need this type of exposure when you get up in the middle of the night to change a diaper or go to the bathroom. Circalights feature LEDs (a.k.a. light-emitting diodes) that emit longer, "red" wavelengths, which are much less disruptive to melatonin production in your brain. We sought a balance between minimizing blue-rich wavelengths and providing white light with a high color-rendering index. Circalights use proximity-sensing UWB technology so that the device only turns on as you approach it. This means that you will only be exposed to light when and for as long as necessary. The light will be triggered by a small sensor that clips onto your pajamas or slippers. Studies have shown that light levels of 1500 lux or greater are sufficient to entirely disrupt sleep, and even 100-500 lux intensity can disrupt melatonin production. Circalights feature "softer" light, at night-appropriate lux levels. We designed our lights to provide a 3-foot radius of warm white light. Imagine multiple pods throughout your environment, lighting and dimming appropriately as you walk past, like a magical circadian-friendly fairy-land. Our mission is to raise awareness about sleep biology and design devices that will enhance your environment. Let's be more well-rested and happy! Here's to some light medicine, cheers! P.S. - Our friends at f.lux provide software for your devices to make them more circadian-friendly. Check them out! UWB stands for ultra-wide band. This is a transmission protocol similar to bluetooth or wifi that allows for wireless communication between devices. This is the technology we chose to use in our circalights and the wearable tag that activates them, because the other tech (i.e. bluetooth) just wasn't smooth enough. Why is UWB special, you ask? Well, the modules we use are accurate to the centimeter and can transmit a lot of information with low energy requirements. In english? Albreiki, Mohammed S., Benita Middleton, and Shelagh M. Hampton. "A single night light exposure acutely alters hormonal and metabolic responses in healthy participants." Endocrine Connections 6.2 (2017): 100-110. Saeed, Yumna, and Sabra M. Abbott. "Circadian Disruption Associated with Alzheimer’s Disease." Current neurology and neuroscience reports 17.4 (2017): 29. Oldham, Mark A., Hochang B. Lee, and Paul H. Desan. "Circadian rhythm disruption in the critically ill: an opportunity for improving outcomes." Critical care medicine 44.1 (2016): 207-217. Kamdar, Biren B., Dale M. Needham, and Nancy A. Collop. "Sleep deprivation in critical illness its role in physical and psychological recovery." Journal of intensive care medicine 27.2 (2012): 97-111.